For the sixth year in a row, Pour la sixième année consécutive, Ferrarista members have offered to have a ride in their Ferrari, at Le Havre, to raise money for a good cause. Many thanks to Joël, JMJ61, AzScud, JMM91, BossProtection, Pierrebx, Trafalgar, Ferdelance76, nanfer28, Guillaume ... for the many rides performed on Saturday the 17th of September at the Docks Vauban at Le Havre. The cause sustained this year was France Alzeihmer 76 that help people with Alzeihmers disease. 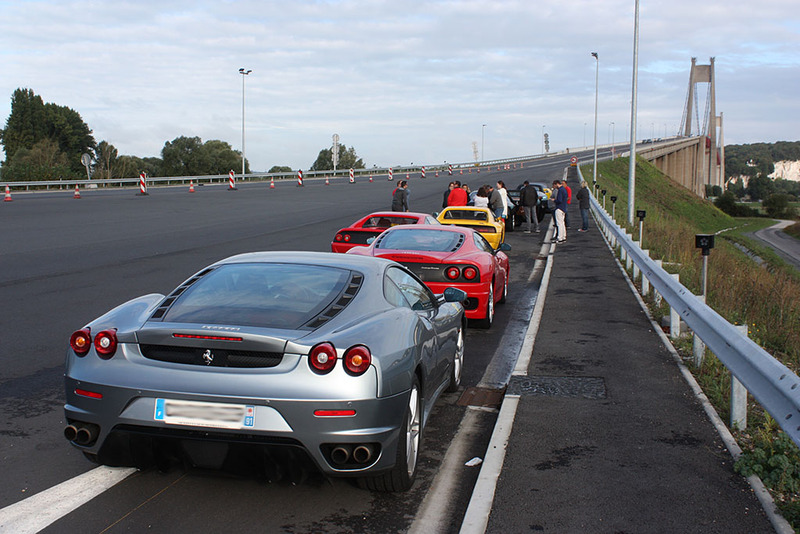 Appointment was taken, for Ferrarista members leaving Paris, on Saturday morning at 8:30 am on the first rest stop after the toll of Mantes-la-Jolie. Rinding together, with a dozen Ferrari before you and in your mirrors, is always a rare pleasure, which allows a great start for a meeting. It also allows participants to meet before the event really starts, which facilitates the integration into the group. A convoy also avoids that some people have trouble finding the precise location of the event. In short, a departure in convoy has many advantages ! Once there, we had to proceed to the inscriptions. These formalities are essential to ensure the smooth running of the event, with only owners who have a license, insurance, a plan of the circuit ... It is the opportunity to retrieve the tickets for lunch and discuss with representatives of the beneficiary association of the operation, France Alzheimer this year. Amongst the cars, a high diversity was proposed by the members of Ferrarista: from the Ferrari 458 Speciale to the Ferrari 612 Scaglietti, through the Ferrari 430 Scuderia, Ferrari F430 and F430 Spider, Ferrari 360 Modena, Ferrari F355 and Ferrari 348. But the other marquees were not forgottel, for even more variety, with an Audi R8 V10, a Corvette Z06 or a Porche 911 Cabriolet, for example. After the first offered rides in the dry, allowing to discover the circuit, it's time for lunch. 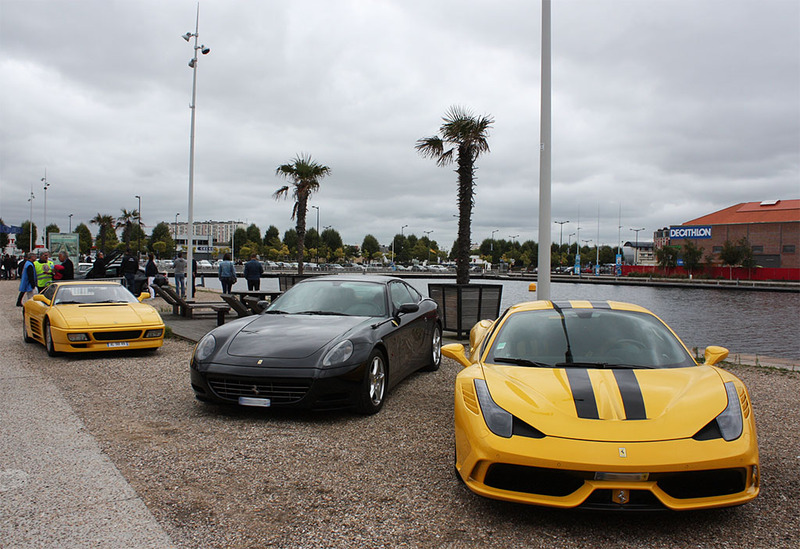 It's a complete menu that was offered in the Pizzria Del'Arte, whose wiondows overlooked our Ferrari. Tomato mozzarella, pizza or pasta choice, tiramisu or dessert sampler, a coffee and a drink : we remain in Italy and the food is good after getting up so early. The restaurant owner came to see us to discuss : he's a Ferrarista member! The afternoon is the heart of the action. From 2:00 pm to 6:00 pm the rain falls, making the road wet and candidates for a ride are rare. Usually we did lots of rides without stopping, this time it was a fight to ge tsomeone for a ride in your car. 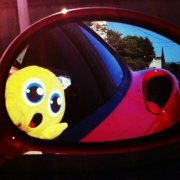 The funds raised will be lower this year, but the smiles of the children, happy to ride in a Ferrari, were there. The slightest affluence has also allowed some parents to offer 4 or 5 rides to their children. Even though the money raised is not yet knpwn, it wil help people with Alzheimer's disease. At 6:00 pm a cocktail was offered, always behind the windows of Pizzeria Del'Arte, allowing to lokk at our cars. The presidents of the two local Lions Clubs took the oppotunity to thank all the drivers. Throughout the event, many announcements at the micro had indicated that the pilots were volunteers and paid their gas, because general public don't know it and sometimes they think they are paid. At 8:80 pm we went to the Les Régates restaurant on the harbor of Le Havre. A maritime atmosphere in the marina, around a good meal, allowed the members to disccus about their day and to better know each other. 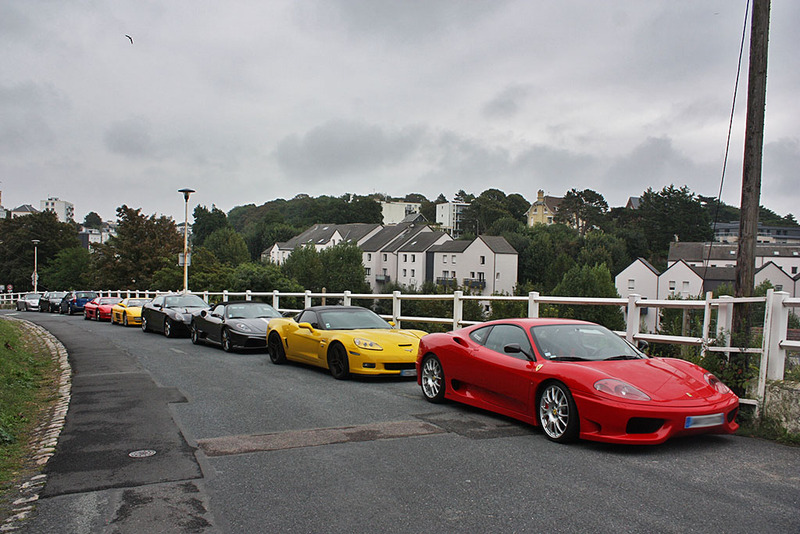 A cruising on the côte fleurie, particulary between Le Havre and Deauville, through Honfleur, was organised on Sunday the 18th of September in the morning to allow the members of Ferrarista coming from afar to spend a whole weekend there and have more time to meet. The sun in the Sunday morning was good after the rain of the previous day and allowed convertibles to drop their hood. In Deauville, all the present members enjoyed a coffee taken on the boards of the famous beach of Deauville. This cruising ended with a lunch at the Country Club of Le Havre. This restaurant offers not only quality food, but also a magnificent view of the city of Le Havre and the whole Seine bay. Ideal to finish off this weekend passed together and to give the will to come back next year! The rain kept us to achieve as many rides as in the previous years. We discussed about it with the members of the Lions Clubs that organize this event and communication around this event should be strengthened to address this case. The cruising on the Côte Fleurie will probably go to Etretat next year. 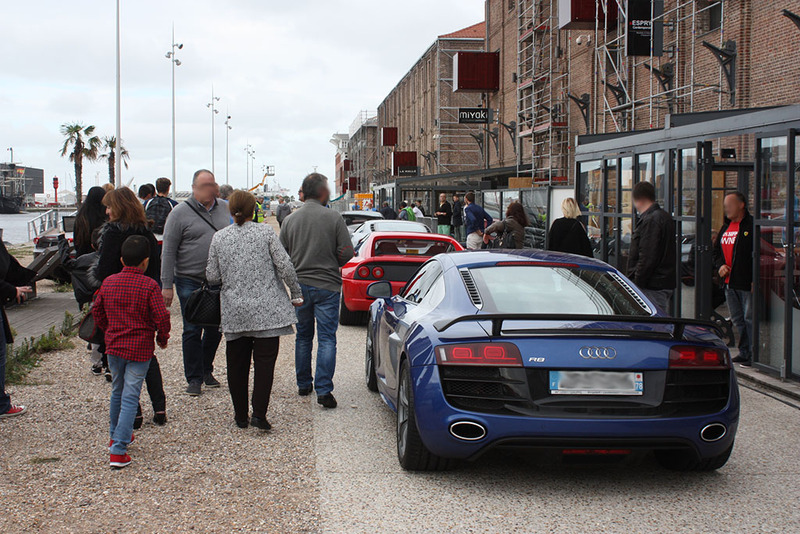 Were you present for the sixth edition of our charity event with our Ferrari in Le Havre? What did you like most? Will you be present next year? présent comme chaque année depuis la première a Saint-Adresse ou la pluie était aussi des notres. baptêmes , mais je reviendrais l'année prochaine ,pour les malades et pour de nouvelles rencontres. Encore merci a Franck pour ces moments passés en bonne compagnie. Présent aussi avec ma F430 pour cette 6 éme édition.Il est important que tous les membres de Ferrarista et autres passionnés se mobilisent pour cet évènement ,de surcroît pour unje bonne cause.Les baptèmes aux docks Vauban du Havre rajoutent aux charmes de cet évènement car situé auprès d'un bassin (Vatine du nom du navigateur disparu en mer) d'ou part tous les ans la transat Jacques Vabre.Les magasins à proximité permettront aux épouses de magasiner comme disent nos amis québécois.Le lions club du Havre et de Sainte adresse se mobilise pour cet évènement avec un parcours fléché bien préparé et avec de longues lignes droites pour pousser nos joujoux en toute sécurité.En bref un évènement à ne pas rater car RDV de passionnés dans la bonne humeur.Merci aux différents clubs présents et leurs représentant dont Franck pour Ferrarista qui se démènent pour pérenniser cette classique au catalogue. 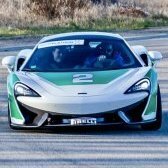 @joel: Merci pour ta fidélité à cet événement comme aux autres événements Ferrarista ! Six années d'actions généreuses, bravo et au plaisir de te revoir lors d'une prochaine sortie. @Ferdelance76: tu as raison, c'est devenu un bel événement classique à ne pas rater, avec le bord de mer en prime ! Merci pour ce beau commentaire et pour ta participation. A bientôt lors d'un prochain événement.